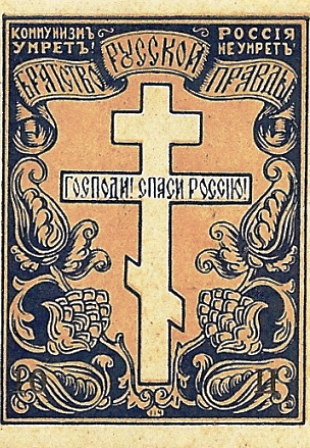 This exhibit tells the history of the ethnic Russian Diaspora and illustrates it with numerous labels that were issued by various organizations for a variety of reasons, including charitable causes, political action, and cultural preservation. Shown together they provide a surprisingly full picture of the evolving political passions, nostalgia, militancy, resoluteness, abiding love for Russia and its history and language, and the Orthodox faith, which motivated generations of Russians abroad. The exhibit is divided into three main chapters. The first, shown in frames 1 and 2, contains non-postal labels (also known as vignettes or cinderellas) that date back to the earliest years of exile through the beginning of World War II. The second chapter, shown in frames 3, 4, and 5, covers the early post-WWII years when new Soviet �migr�s displaced by the war and unwilling to return to the USSR joined the old Russian Diaspora. The final chapter begins in Frame 5. It covers the �migr� history from approximately 1950 to 1992, when modern Russia emerged from the dissolved USSR. Highlights: Perhaps the most unique feature of this exhibit is its attempt to show the full range of vignettes issued by ethnic Russian �migr�s in various host nations from the earliest years of exile to modern times. A portion of this material has been cataloged, but much remains unknown and unrecorded. As a result, the exhibit serves the additional purpose of providing a basis for cataloging such vignettes in the future. Because the printing runs were very limited and practically no one considered saving "worthless" labels, few of them have survived. Some, found in these frames, can be traced back to a fine 1970s collection of vignettes. No duplicate copies have surfaced since then. The most complete group of vignettes shown on these pages is contained in frames 9 and 10. With just one exception, they show the full range of "Free Russia" labels, along with some essays, proofs, and errors. In frame 5, complete souvenir sheets and their folders, issued in 1961 by the Union of Russian Invalids in Paris, are noteworthy. So is the material shown in the first two frames. Some exceptionally rare DP camp post stamps are shown in frames 4 and 5. The list goes on. This collector's suggestion to anyone interested in the Russian Diaspora's history is to simply download each frame, read the text, and view the vignettes. You won't be sorry.